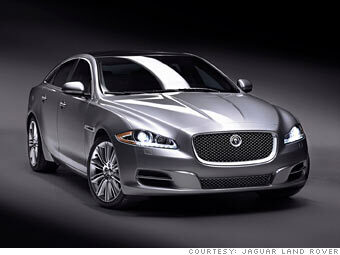 Jaguar unveiled a new, and very different-looking, XJ sedan in London Thursday. The new full-size sedan signals a radical departure from Jaguar’s past reliance on a stiflingly “classic” design. It’s a new look for a brand that is struggling, under new ownership, to come back from a tattered image. “Over the last 20 to 30 years, quite frankly, Jaguar lost its way,” said Jaguar managing director Mike O’Driscoll in a telephone interview from London. Last year, Ford Motor Co. sold Jaguar and Land Rover, which had become Jaguar’s SUV alter ego, to Tata Motors of India. Jaguar’s make-over had already begun under Ford. Quality has been improved to the point that Jaguar, a famously undependable brand, topped a recent J.D. Power vehicle dependability survey. The smaller Jaguar XF was also rolled out just before Tata’s purchase. It’s design foretold a lot of the new XJ’s look, with its blunt nose and swept-back roofline. But the XF also provided a cautionary note. Quality glitches plagued the first cars off the assembly line and sullied what should have been a triumphant comeback. The first 2010 XJ’s, slated to enter dealerships late this year, will be problem free, he promised.